Hairline Feminization: Who is a candidate & Ideal FFS Surgery approach? Hairline feminization with or without hair transplants? 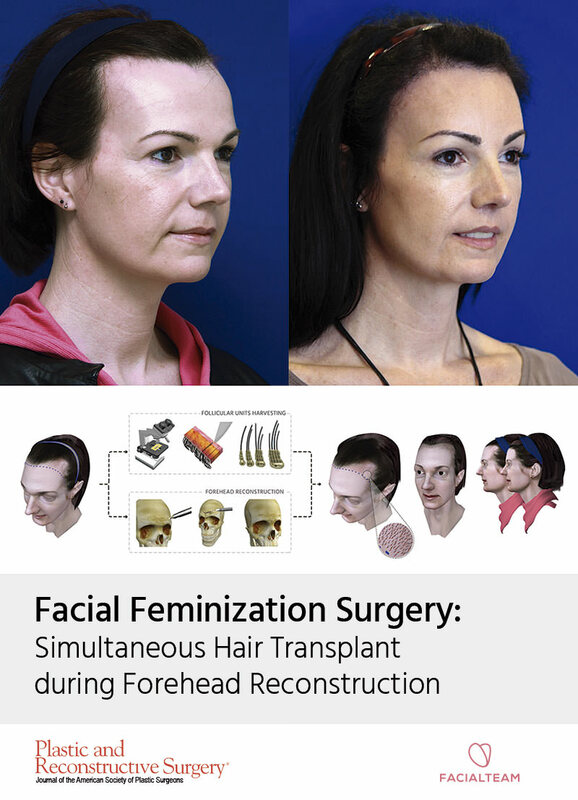 We at FACIALTEAM have a great interest in the topic of hairline feminization. 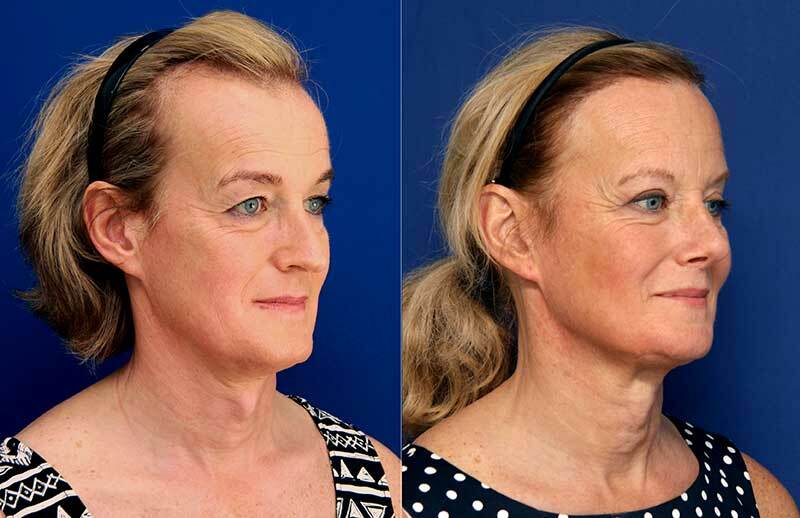 Feminizing hair transplants within the framework of facial gender confirmation surgery (a.k.a facial feminization surgery or FFS) is a common enquiry, so we would like to offer clinical guidance on the subject regarding how to determine the most suitable treatment as well as the timing and order of treatments. First, we should begin with the premise that the ultimate goal in hairline feminization is to achieve a natural layout, with appropriate density, creating a feminine shape which is also harmonious with the facial structure of the individual patient´s features. It must be remembered that, in general, a female hairline tends to have a rounded format, while a male hairline is identified frequently by the presence of an M-shape due to the lateral peaks or recessions. Male and female hairline prototypes and The Lipuhai Rule. 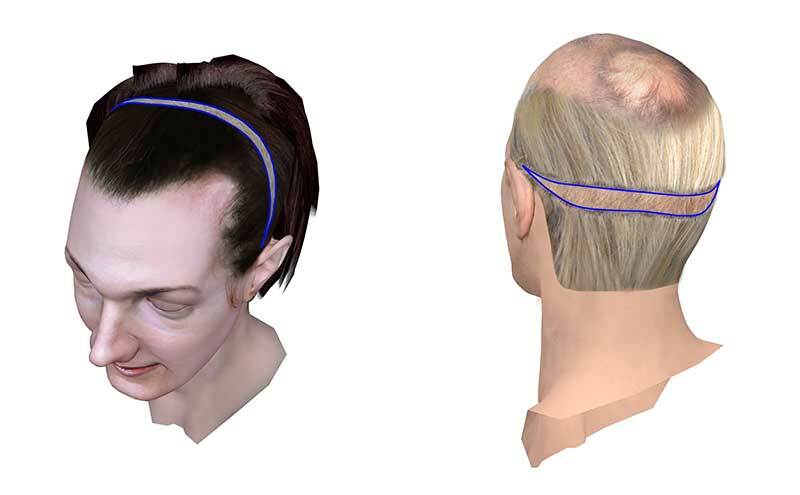 Prototype of a woman with a rounded hairline and a man with an M-shaped pattern due to the lateral peaks or recessions. The Lipuhai Rule: the distance between the interpupillary line and the intercommissural line is applied to the facial upper third. In general, with men it coincides with the hairline, while with women it falls somewhat below. Courtesy of Alexandra Hamer. Speaking on behalf of our surgical group and Research & Development Department, we have always made it a priority to establish parameters that allow us to identify the problems of each hairline individually in order to give the best possible hairline feminization option. Our clinical conclusions on the subject will soon be available in an extensive and detailed scientific article pending publication in a prestigious medical journal. We have always made a priority to establish parameters that allow us to identify the problems of each hairline individually in order to give the best possible treatment option. Hairline improvement with hair transplants is indicated in those patients with male formats (visible peaks and/or mild recession of the hairline) and a complete stabilization of the balding phenomena (stabilization typically occurs with hormone therapy). Surgically lowering the hairline (scalp advancement) is indicated only in very specific patients with excessively high hairlines yet with a rounded format already (without M-shape). In our experience, only 1 in 20 patients benefits from this technique. Remember, this approach presents two potential drawbacks: the possibility of visible scarring and to generate an overly low forehead at the center point (which is masculinizing). Patients who are good candidates to redefine their hairline by hair transplants must meet certain requirements in addition to stabilizing the balding phenomena, such as proper hair density and hair follicle quality. Density should take precedence over the surface area to be covered. That is, in patients with very large areas to be treated, it is important to ensure there will be appropriate density or volume. If the hair transplant is too overly extended, there is a risk a poor outcome due tosparse areas where the scalp is visible. If required, a second transplant session is preferable to a single transplant with artificial results. It is important to maintain a natural and irregular hairline. No hairline is straight. Nor should transplants be placed too close to the eyebrows, as a very low hairline looks artificial. Finally, an excessive drop in the hairline at the central point can result in a short forehead which is actually typically masculine, according to extensive studies of facial prototypes (Alexandra Hamer). Before FGC: Either by FUSS techniques (follicles obtained from a posterior strip) or FUE (obtained follicles one by one). Our recommendation is to wait at least 12 months after transplants so that the grafts are in optimal conditions and therefore follicle viability is assured. Simultaneously with FGC: Via the FUSS technique, so the follicles are obtained from a strip removed near the crown as part of the coronal approach of forehead reductions. Since this strip contains a considerable amount of hair follicles (1400 to 1500 units), it is possible to immediately perform a simultaneous hair transplant (SHT), with results dependant on the actual amount of follicular units obtained. This approach offers the advantage of being able to undergo a complete feminization of the upper third of the face (forehead and hairline) in one surgical operation. The technique, developed by FACIALTEAM, is yielding very promising and high quality results, although a second hair transplant may be required in patients which need to cover a larger area or if the strip contains sparse or low-quality follicles. After FGC: Either the FUSS or FUE technique. We recommend a minimum of 6 months after feminization of the facial bone structure, to ensure proper healing and consolidation of the soft tissues in the operated regions. Surgically lowering the hairline (scalp advancement) is indicated only in very specific patients with excessively high hairlines yet with a rounded format already (without M-shape). * No case is exempt of the possibility, if necessary, that a second session of hair transplant may be required to further improve results, especially to close large peaks or for increased density in certain areas. The need for a second session would be assessed by the hair transplant specialist, depending on the results of the previous hair treatments of the patient. 7. Each patient must be evaluated individually so that the most appropriate solutions are recommended based on your specific case (hairline format, general recession, extent and width of peaks, other bare patches, etc.) It is also important to assess what details and circumstances are important to the patient in order to generate optimal results commensurate with expectations. We hope this summary provides guidance to patients considering feminization of the hairline. It is more complex than it seems and is an ever evolving subject. Any questions or contributions will be very welcome.